Retro 1 Black Toe Drawing is Live! 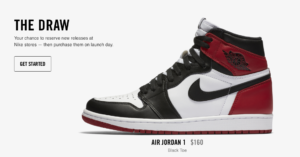 If you didn’t have a pair of Retro 1 Black Toe Jordans already reserved online, you might be able to lock it down in store. The Nike Draw for the Retro 1 Black Toe is open now. Drawing ends at 7 PM EST (4 PM PST) Good luck sneakerheads!